With the first half of 2014 now in the books, many investors are happy with the performance thus far, especially given the economic headwinds that few saw coming. The 26% rally in U.S. stocks in 2013 gave way to a more modest 7% gain in the first half of 2014. Most see this as a positive development in a maturing market. But beneath the surface, important trends are emerging that should give investors reasons to re-evaluate their assumptions. During the second quarter of 2014 the S&P 500 continued to post new all-time highs while volatility remained remarkably low. Oftentimes such a combination reflects investor complacency which can be dangerous. Already a rotation toward more defensive positions is underway. For example, through the first half of the year, total return for the Russell 2000 (a barometer for domestic growth) was just 3.3% (IWM) while total returns for defensive assets like Treasury Bonds (TLT) and the S&P 500 Utilities sector (XLU), were 12.9% and 18.5%, respectively. The latest crop of price data and the market's own internal market dynamics also suggest that inflation expectations are on the rise. During the first half of 2014, the CRB Commodity Index (CRY) and Gold (GLD) were each up over 10%. Again, this compares with the domestic equities, represented by the Russell 2000, returning just 3.3% (IWM). Rising U.S. inflation and slowing U.S. growth are not the conditions that many investors have prepared for. At Euro Pacific our global strategies are designed to outperform in such an environment. As a result we saw solid results in the first half of the year. 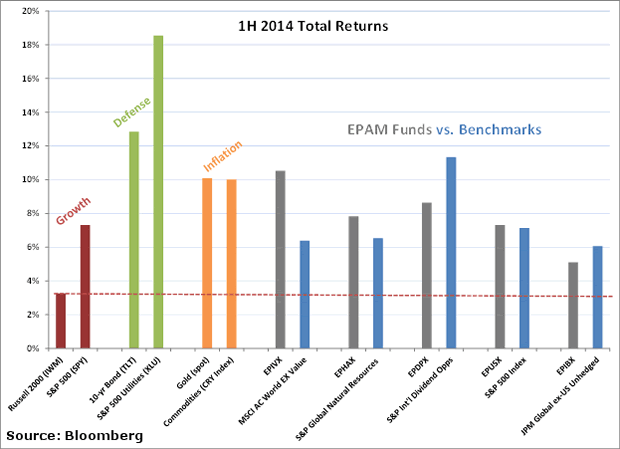 There can be little doubt that the growth momentum that buoyed the market in 2013 came off track in 2014. GDP had grown sequentially in each of the first three quarters of 2013 reaching 4.2% in 3Q13, which was the second highest level since 2006. (BEA, Jan 30, 2014). This momentum was cut short in the first quarter of 2014, which was confirmed when BEA reported annualized 1Q14 GDP at negative 2.9%.,the weakest quarter since the end of the Great Recession in 2009. While most pundits blamed the surprisingly weak performance on severe winter weather, our research suggests that the unusual cold and snow would be expected to knock just 2% of annualized growth off of GDP. Instead the results were fully six points below earlier expectations that first quarter growth would approach positive 3%.Even if the newly released preliminary estimate for 2nd quarter GDP does not get revised downward (as is usually the case with these figures), 1st half growth will come in at just 1%, or 2% annualized. This is far below the forecasts that held sway back at the end of 2013. Despite the dismal first half miss, consensus remains that the economy will get right back up on its feet and is on the verge of hitting "escape velocity." The forecasters base this view on optimistic view on the outlook for housing, capital investment, and employment. While we do not claim to have an edge on making near-term economic calls, we are somewhat skeptical of all three of these factors. In 2012 and 2013, the U.S. housing market improved considerably, but this was from historically depressed levels following the Great Recession. From the 2006 peak into early 2012, the Case-Shiller Price Index declined by 35%, which provided an attractive buying opportunity for investors who were flush with cash (i.e. private equity investors), and those solvent households that were able to borrow at historically low mortgage rates (2012 average 30-yr rate 3.7% vs prior 5-yr avg. 5.3%). As a result, between 2012 and 2013, existing home sales increased 30% and house prices gained 25%. Now, it appears those "easy gains" have ended as 1) cash investors are no longer buying and actually starting to sell, and 2) mortgage rates are set to rise as the Fed continues to Taper its QE program. [ The impact of these trends is already showing in the data. Since ex-Fed Chairman Bernanke first hinted about the QE Taper in the summer of 2013, mortgage rates have risen almost 100bps (30% increase). Over this same time, MBA Mortgage applications have fallen by 60%, existing home sales have declined 15% and house price gains have slowed. While another near-term bounce is possible, we believe a sustainable recovery is less likely. Household balance sheets remain stretched, income growth is barely keeping pace with inflation, and affordability is declining (higher house prices plus rising interest rates). In 2009, Gross Private Investment collapsed to almost 12% of GDP, which was the lowest level in the post WW2 period and compares with a median level of 19% in the three decades prior to the Great Recession. Since 2009, Gross Investment has rebounded and is now 16% of GDP. Many growth bulls expect this level to rise over the next few years, noting that the average age of U.S. capital stock (i.e. plant/equipment) is at record highs and needs to be upgraded. Recently, this view has gained traction with improvements in forward-looking surveys, like the Purchasing Managers Index (PMI). In the near-term, we do expect a modest bounce in capital investment to make up from weather related disruptions earlier in the year, but we are more skeptical about a multi-year boom. First, we believe much of the recovery in private Investment was supported by bonus deprecation tax benefits (initiated during the recession) that enticed many corporations to accelerate investments in 2010-13. These incentives ended on Dec 31, 2013, so businesses have less reason for new investment. For companies to increase investment without government support, sales levels need to increase, which will remain difficult as household balance sheets and incomes remain under pressure. As a note, the current level of private investment (16% of GDP) is below median levels during the thirty years prior to the Great Recession (19% GDP), but it is consistent with the thirty year period following WW2 (17% GDP). Second, companies have recently been more inclined to acquire rather than try to grow organically. In the first half of 2014, total U.S. M&A deals were over $750B, which was up 50% from the same period in 2013 and on pace to hit annual levels not seen since 2006-2007. Also, almost 95% of recent deals have been strategic (companies, not private equity, buying other companies) which compares with just 75% in 2006-07. If companies saw organic opportunities then this cash would be invested in new plant and equipment instead of paying premiums for existing firms. With easy access to relatively cheap capital, we expect the M&A spree to continue, noting that this will actually result in job losses (vs. capital spending that drives job gains). Finally, companies that have not found attractive M&A opportunities have been using cash to raise dividends and buy back stock. In the first quarter of 2014, U.S. share buybacks and dividends hit a record level of $241 billion. Returning excess cash to shareholders is normal when growth prospects are dismal, but the recent trend has been exacerbated by activist investors that are pressuring companies to use leverage to return cash. As a result of this, combined with M&A activity discussed above, business (non-financial) leverage is at record levels. This bodes poorly for a surge in real investment. In the first half of 2014, new job additions totaled 1.4 million (BLS establishment survey), which was the largest six-month increase since 2006. At the end of June 2014, the unemployment was 6.1%, down from 7.0% at the start of the year. Government officials have crowed that the economy has now regained all jobs lost in the Great Recession. But this is strictly a measure of quantity not quality. It is widely understood that low paying and part time jobs have replaced higher paying full time jobs. But even the raw number of jobs has failed to keep pace with population growth. At the end of June, the employment to population ratio was 59%, essentially flat since 2010. This compares with a median level of 62% in the thirty years prior to 2006. To get back to that level, the economy would need to add another 10 million jobs. Assuming the current pace of job gains (using average of Jan-June 2014 gains in the Household survey) and trend growth in the working-age population, it would take another five years for the employment to population ratio to reach that level. The combination of low employment to population and low labor force participation means that 41% of the working age population is not employed, which compares with pre-Great Recession levels closer to 35%. That means that roughly 100 million people or one-third of the entire U.S. population is not working. This is hardly a sign of a solid labor market. In other words, the consensus is making a pile of questionable assumptions about the pillars upon which a continued recovery would be based. But while growth is failing to materialize, inflation is on the rise. Back in January of 2012, Fed Chairman Ben Bernanke did something that no Fed Chairman had done before: He publicly set a 2% inflation target. Well, apparently, the Fed is not nearly so impotent as we had believed. It only took 2 and ½ years for the Fed to achieve this goal (this is if you give full credence to their statistics). 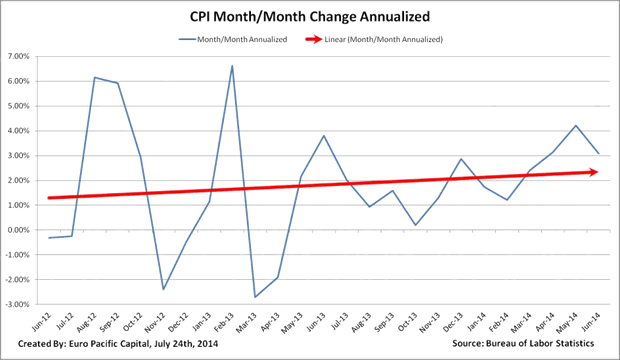 The latest CPI report for June 2014 came in at 2.1% year over year. This follows very similar numbers in April and May. More importantly inflation shows signs of heating up more recently. The last four months of data (March - June) show average annualized month over month changes at 3.2%. Finally, the Fed has rescued us from the abyss. Not only have they rescued us, but they hit the sweet spot. According to modern day Keynesian theories, with 2% inflation achieved and 0% interest rates, the economy should be humming right along. But the theory is not translating into practice. Companies are starting to feel the price squeeze and are passing on rising input costs in a variety of ways. This is true across many industry verticles. Hershey just announced an 8% increase on chocolate across the board. Then Mars Candy followed suit by raising their chocolate prices 7%. Starbucks has raised prices between 5 and 20 cents per drink. Chipotle has raised prices between 4% - 12.5% depending on location. The hits keep coming: Adult tickets at Disneyland (4.3%), Netflix (12.5% for new customers), SeaWorld (3.3%), Nike (11%-20%). Even the federal government (USDA) forecasts that prices for fruits and vegetables will rise 6% in the next few months. The Food CPI index over the last four months is ominous, up 4.2% annualized. Beef prices also continue to be at all-time highs. Unfortunately these increases have risen faster than incomes.